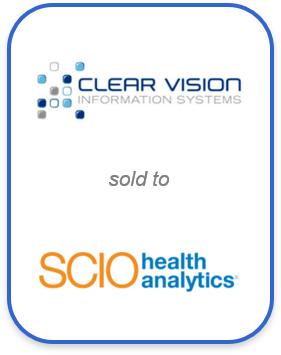 Clear Vision Information Systems, Inc.
CVIS offers data analytics Software as a Service (SaaS) to health plans, provider groups, and ACOs nationwide. The company’s core product, RevMaxPro, provides risk adjustment analytics that identify, track, and report chronic conditions in the Medicare Advantage (MA) market. This platform also provides near real-time assessment of risk or revenue potential associated with care and reporting of chronic conditions. RevMaxPro is NCQA certified and offers quality reporting for HEDIS and Stars for MA, Medicaid, commercial and exchange plans. Its DxMax offering is a turnkey solution that captures missing diagnosis data from inpatient stays for Medicare Advantage, Medicaid and commercial plans. The co-founders of CVIS were interested in identifying a strategic counter-party that could best take advantage of the company’s industry thought-leadership in risk adjustment to capitalize on significant market opportunities. They were also seeking financial liquidity. Combined with SCIO Health Analytics, the business now is better strategically-positioned with a wide array of complementary care management and payment integrity offerings; and management has access to more financial resources to invest in its growth. Synergy achieved the owners’ immediate monetization objectives, as well as the potential to capture meaningful long-term appreciation through equity participation in the combined entity. ©2017 - 2019 Synergy Advisors, LLC.